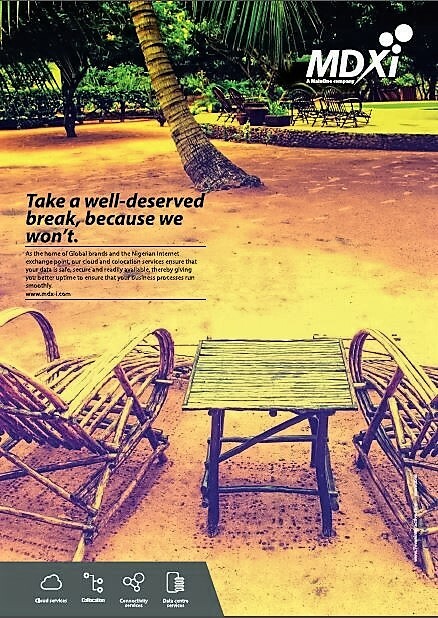 West Africa’s premier Data Center solutions provider, MDXI (a MainOne company) has launched an advertising campaign aimed at reinforcing the company’s position as the data center provider of choice for Enterprises in the region tagged “Take a Break”. The campaign will increase awareness of the MDXI brand as the most interconnected and reliable West African datacenter company and urges C-level executives across the region to take a break from the rigors of managing in-house IT and outsource their Information Technology infrastructure needs to MDXI. MainOne’s MDXI has put Nigeria on the global map, with its premier Tier III Lekki Data Center, the only data center in West Africa that is authorized to process and store payment card information with its PCI DSS certification. MDXI is also certified as ISO 27001, 9001 compliant and is the only SAP certified provider of hosting services in the region. The company has contributed significantly to deepening Nigeria’s digital economy with its highly available, carrier-neutral ICT infrastructure, enabling network operators and content providers exchange traffic within its data center. As West Africa’s most connected data center and home of the Internet Exchange Point of Nigeria (IXPN), MDXI has impacted internet traffic in-country, by localizing traffic, reducing transmission costs and improving user experiences.